All Products have been sold Out. The "Official" and the "Souvenir" encased coins produced for the 10th Anniversary. 50 of the US 5 cent Souvenir encased. The 5 cent coins were encased in brass and aluminium rings. 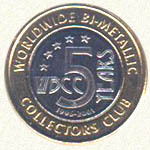 Members could also have their WBCC number engraved in the obverse ring. 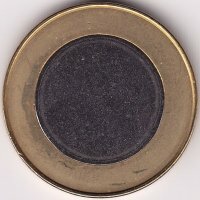 The Austrian 1 Euro was chosen for the Official encased coin. The Netherlands 5cent and US 5 cent were chosen for the souvenir encased coin. 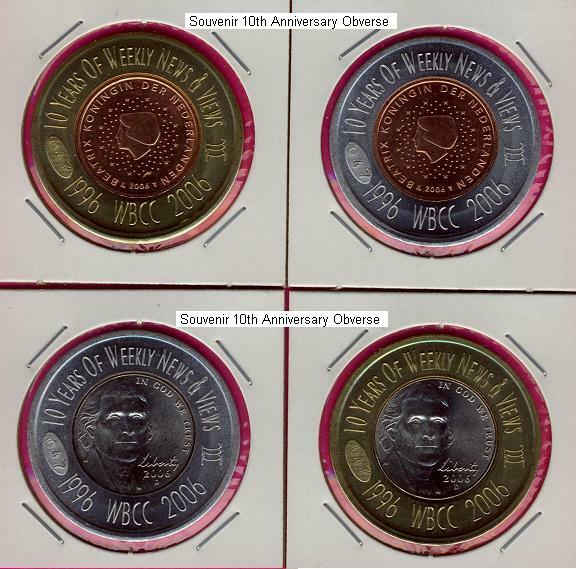 Over the years the WBCC has been encasing selected World Coins. WBCC 5 Years Phone Card. Massimiliano Aiello, Italy WBCC member #73, has developed a phone card (see below) commemorating the WBCC 5th Anniversary, WBCC attendance at World Money Fair 2002 in Basel and the coming of EURO. This phone card can be ordered directly from "Max" by email at the cost of US $10 (Shipping and Handling included). Place your email order here. Select HERE to View a Larger Image WBCC Bi-Metallic Engraving Project. With a new year, a new WBCC Bi-metallic project, coordinated by Martin Peeters. Martin has acquired Bi-metallic coin blanks (copper ring/nickel center, currently used by the Dutch Mint), and can have each engraved as shown in the image. The engraving will be the WBCC member's name and member number, or the member's initials and member number. The cost for 1 blank is about US1$, engraving each letter is US50¢ each. The cost for the example shown would be about US1$ + (25 x US50¢) = US13.50$. The cost for two initials and the member number would be US8$. Postage costs is additional. 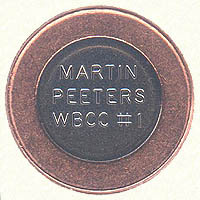 Email all orders and/or enquires to Martin Peeters, Netherlands, Focal Point of the WBCC. The World's First Encased Bi-metallic Coin.. 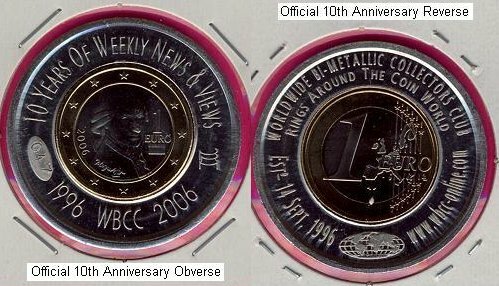 The WBCC has developed the very first encased Bi-metallic coin. 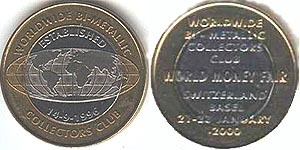 Like the others of 2001 (shown below), it commemorates official WBCC representation at the World Money Fair, in Basel, Switzerland, and the American Numismatic Association, Coin Fair in Atlanta Georgia, USA. 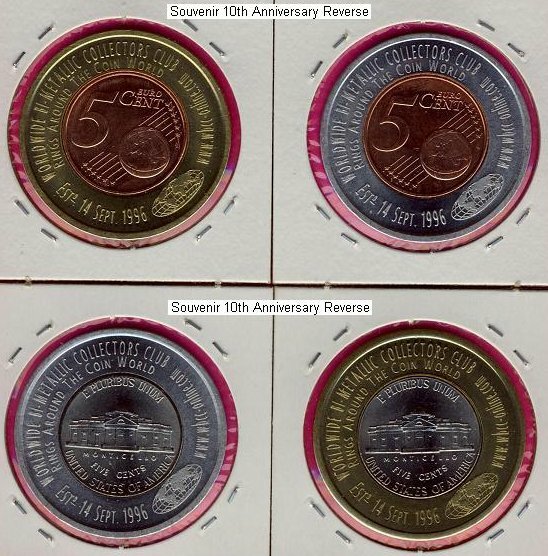 The Encased coin selected for this project is the 100 Sucres of Ecuador making this the first known encased coin of Ecuador and the world's very FIRST encased Bi-metallic. The production run was for only 100 specimens of the coin. 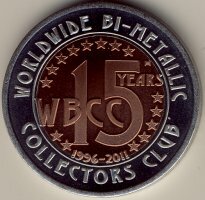 Commemorating the WBCC's 5th Anniversary, "The World of Bi-Metallics" token designed by Frans Dubois, is now available for a short time only. On September 14th of this year, the WBCC celebrates it's fifth anniversary with this limited edition token (only 100 pieces). The token's obverse design announces the club's anniversary while it's reverse design matches club's first two tokens. To place your order, contact Frans Dubois by email. The cost for this token is US7$, plus US1$ postage per piece. "The World of Bi-Metallics". The WBCC Catalogue that is updated every few months by Martin Peeters, WBCC#1, and sent free to members by email as an attached EXCEL file. And information on varieties, errors and related Numismatic Literature. 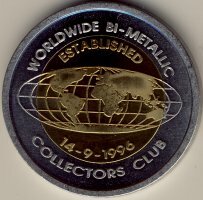 Please contact Martin Peeters, WBCC#1 to make arrangements to recieve WBCC Bi-Metallic Catalogue. 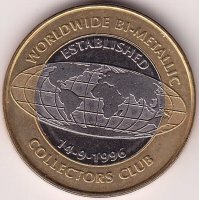 A compilation of the WBCC documentation of bi-metallic coins complete with graphics. 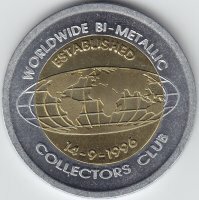 The early Introduction and Use of Bi-metallics from Larry Friemel's "All That Is Bi-Metallic" webpage complete with graphics. The complete set of all WBCC Newsmails from beginning to the CD's production date. The latest version of "The World Of Bi-metallics" as of the CD's production date. A super demo software program specifically designed for collectors. Please contact Martin Peeters, WBCC#1 or Joseph Kocian to make arrangements to recieve WBCC Bi-Metallic CD ROM. Select either image to view a larger version. 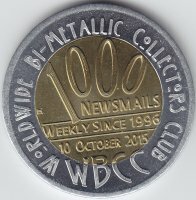 The official WBCC 2000 token. 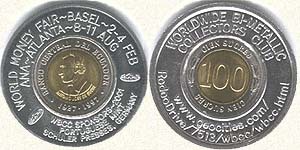 This limited edition of only 300 bi-metallic coins was produced specifically for the Basel Fair Jan 2000. Read about it in Newsmail#179. Mintage 113. Originally 100 planned but the machine produced 113. Notice: The use of the WBCC logo on products offered on this page has been approved by the WBCC board, however the WBCC receives no portion of moneys paid in any transaction and is not responsible for any products or offerings. All sales transactions are between the buyer and seller. any other Club Site page, please contact the Webmaster.